This re-examination of the raison d’etre of day schools goes beyond the rewriting of mission statements – it cuts to the core of what day schools are for and why they are invaluable, if not irreplaceable. This process can be both frightening and energizing, and raises many questions. Who should be involved in that process – day school heads, middle management, teachers, students, parents, lay leaders, communal religious leaders? Are the goals identified going to be descriptions of “ideal graduates” with the requisite body of knowledge, skills, beliefs, and behaviors, or a picture of adult members of the Jewish community five, ten, and twenty five years beyond graduation? Will the goals be measurable and demonstrable, or will we have to wait a generation to see if we are successful? 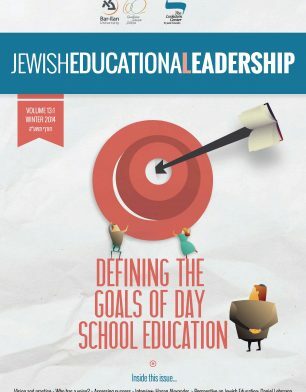 Yogi Berra is famously quoted as saying, “If you don’t know where you’re going, you might not get there.” This issue of Jewish Educational Leadership is dedicated to re-opening the question of where we are going.